assets, among others. A total of 1,814 formal establishments/firms responded for the industrial enquiry. Imputations were done for 438 establishments that did not respond based on other regular surveys and other administrative sources. 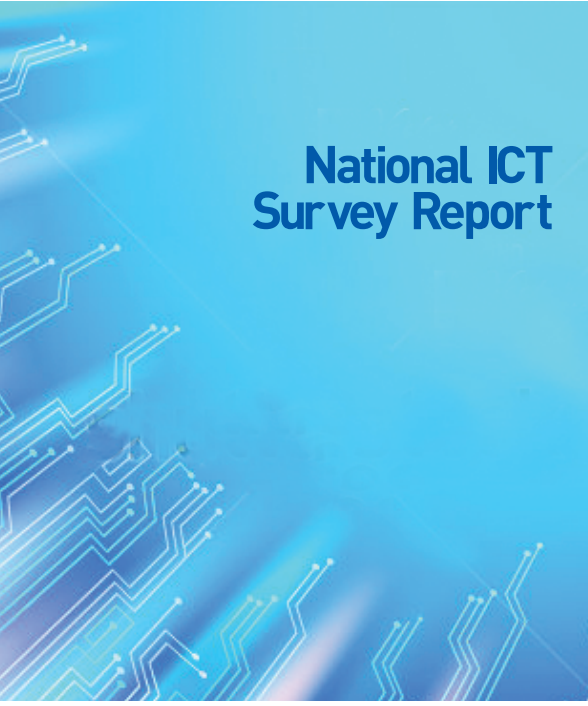 The final results as reflected in the report are aggregated at the two digit (division) of ISIC. The total output of the industrial sector in 2009 was KSh 1,009.2 billion with total gross value added of KSh 319.8 billion. Manufacturing activities recorded the largest share of industrial production, accounting for 90.3 per cent of total value of industrial output. This was followed by electricity, gas, steam and air conditioning supply which recorded 7.9 per cent of the total output. The total number of persons engaged as at June 2009 was 324,841 with about half of them based in Nairobi. The manufacturing sector accounted for about 94 per cent of total employment within the industrial sector. Most of the employees in industry were males at 77.2 per cent. A total of 30 per cent of establishments reported capacity utilization below 50 per cent. Some of the key reasons cited by the establishments leading to under-utilization were the high cost of fuels, electricity and raw materials during the reference period. Overall, the value of inputs into the sector‟s production process was estimated at KSh 701.9 billion, of which KSh 689.3 billion was intermediate consumption. 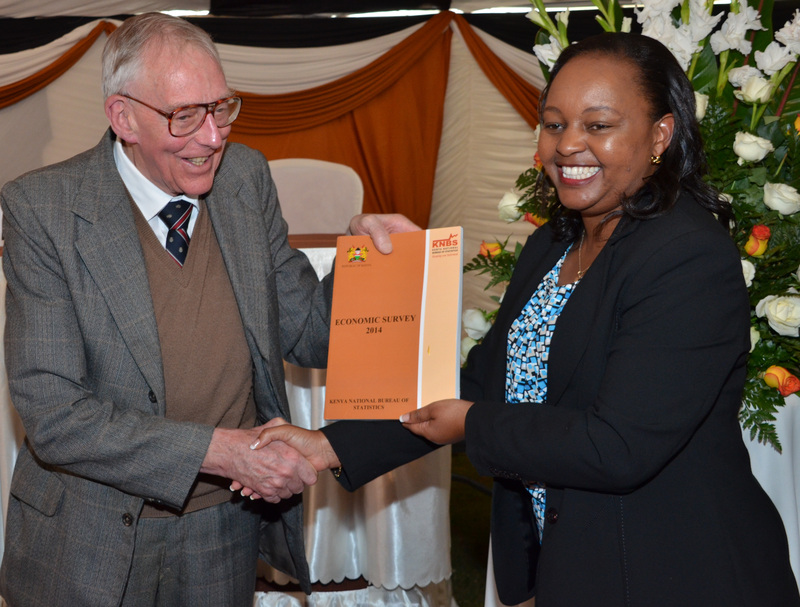 Cost of raw materials constituted 81.2 per cent of the inputs into the process of production activities of sectors. Energy and water accounted for 8.1 per cent of the input costs while expenditure on other type of inputs amounted to 10.6 per cent. In 2009, inventories were estimated to have reduced by KSh 902.6 million which could have been attributed to an upsurge in economic growth after a slowdown in 2008. Finally, value added (contribution to GDP) of the formal industrial sector was KSh 319.8 billion. 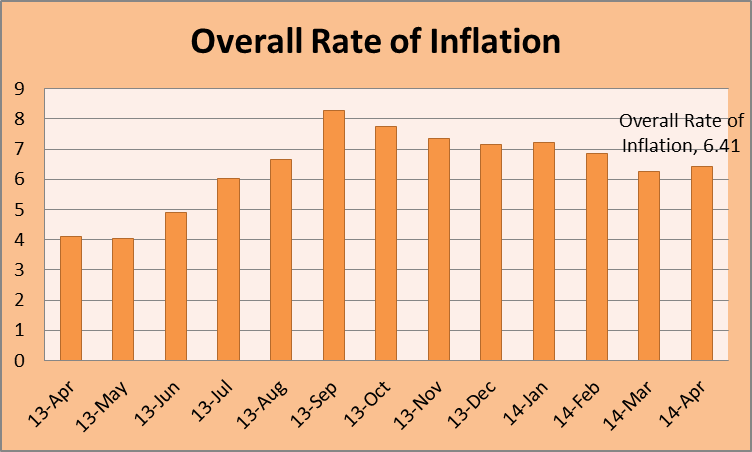 Kenya National Bureau of Statistics hereby releases Consumer Price Indices (CPI) and rates of inflation for April 2014. These numbers have been generated using data collected during the second and third weeks of the month under review. The prices were obtained from selected retail outlets in 25 data collection zones located in 13 urban centers. The country’s Gross Domestic Product (GDP) expanded by 4.7 per cent in 2013 compared to 4.6 per cent in 2012. The stable macroeconomic environment for the better part of the year. Low and stable inflation supported by improved supply of basic foods, lower international oil prices and lower costs of electricity. The Kenya National Bureau of Statistics (KNBS or the Bureau) is a corporate body established under the Statistics Act (2006). It is the principal Government agency responsible for the collection, compilation, analysis, publication, dissemination and custody of official statistical information. It also oversees the coordination, supervision and development of programmes within the National Statistical System. Job Purpose: Reporting to the Board of Directors, the Director General, (Chief Executive Officer) will be responsible for all the activities carried out in the Bureau. Any other responsibilities as may be necessary to achieve the Bureau Objectives or as assigned by the Board. Meet the requirements of chapter six of the Constitution of Kenya, 2010 on leadership and integrity. Applicants should submit application letters accompanied by a detailed curriculum vitae using the given format; provide daytime contacts and certified copies of academic and professional certificates, transcripts, testimonials and National ID/Passport. Kindly note that failure to attach the required documents will lead to disqualification. Applications must be received not later than 25th April 2014.Only shortlisted candidates will be contacted. 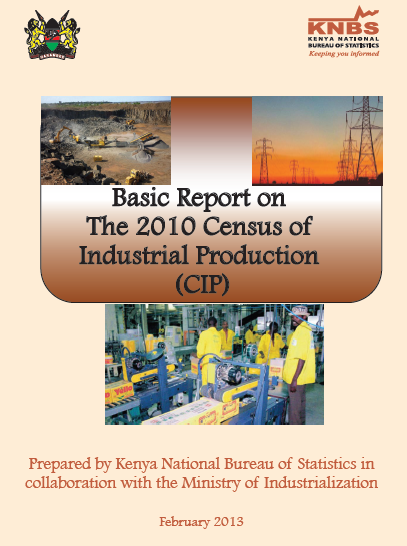 Kenya National Bureau of Statistics hereby releases the Producer Price Index (PPI) for the March quarter of 2014. Producer Price Index measures the gross changes in the trading price of products on the domestic and the non-domestic markets, at all stages of processing. The price changes are measured from the perspective of the producer. The producer prices are collected as at 15th February, 15th May, 15th August and 15th November of the year. These dates corresponds to the first, second, third and fourth quarters respectively. The Producer Price Indices are grouped according to the International Standards of Industrial Classifications of All Economic Activities (ISIC) Rev 4. The overall producer prices increased by 0.47 per cent in the first quarter of 2014 compared to 0.37 per cent recorded in the fourth quarter of 2013. The ‘year on year’ PPI inflation, from March 2013 to March 2014 was 0.10 per cent. The main contributors in the first quarter increases were manufacture of beverages and manufacture of chemicals and chemical products. Under manufacture of beverages the producer prices for malt liquor and malt increased and this caused the index to rise by 7.68 per cent. Manufacture of food products declined by 1.4 per cent mainly due to falls in producer prices of sugar and tea.